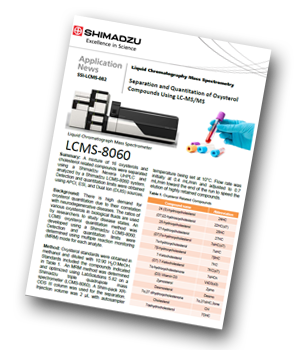 Shimadzu has produced an application note presenting a fast, sensitive LC-MS/MS method for the separation and quantitation of oxysterol compounds using LC-MS/MS. There is high demand for oxysterol quantitation due to their correlation with neurodegenerative diseases. The ratios of various oxysterols in biological fluids are used by researchers to study disease states. This application presents a fast, sensitive LC-MS/MS method, with detection quantitation limits determined using multiple reaction monitoring mode for each analyte. A mixture of 16 oxysterols and cholesterol-related compounds were separated using a Shimadzu Nexera UHPLC and analysed by a Shimadzu LCMS-8060 system. Detection and quantitation limits were obtained using APCI, ESI and Dual Ion (DUIS) sources. Although ESI was able to obtain low detection limits for most oxysterol-related compounds, it had difficulty reaching practical quantitation limits for zymosterol and desmosterol, even in neat standards. APCI allowed better quantitation for these two compounds, however, the LODs and LOQs for many other compounds were sacrificed. DUIS offers the benefit of both APCI and ESI by allowing quantitation of zymosterol and desmosterol without significantly sacrificing the LODs of other compounds. Therefore, DUIS is the optimal source for analysing this oxysterol-related mixture. The dual ion DUIS source is able to quantify all sixteen analytes in a single run instead of two runs using ESI and APCI sources separately.